Jim moved his company from Washington to New York in 1963 and over the next ten years, he expanded his team and the range of projects they pursued. His office on East 53rd accommodated a small group – Jim, Jerry Juhl, Frank Oz, Don Sahlin, Jerry Nelson, various secretaries and a few people providing temporary creative help. 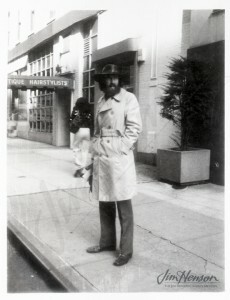 When the work expanded from Muppet appearances and commercials to include experimental films and television projects, long form specials and the development of the Cyclia nightclub, Jim moved the whole operation uptown to two floors of a nineteenth-century carriage house at 227 East 67th Street. He had a workshop area, editing equipment and office space. By 1973, those new Henson offices were bursting at the seams. With Sesame Street rolling along and new opportunities for television programs, the team had expanded to include Diana Birkenfield, Al Gottesman, Bonnie Erickson, Caroly Wilcox, Faz Fazakas, Richard Hunt, Fran Brill, Caroll Spinney, John Lovelady and Danny Seagren. As the chance for a live Broadway show and a series of Muppet specials appeared on the horizon, along with Jim’s recruiting of Dave Goelz to start that summer, it was clear more space was needed. Jim looked down the block and found empty space on the corner of Third Avenue. He signed a lease for 201 East 67th Street in March, and while he was in LA performing on the Emmy Awards show and meeting with Michael Eisner at ABC, the Henson workshop moved into the new space. Jim’s own office and the production offices along with the accounting/business staff remained at number 227. 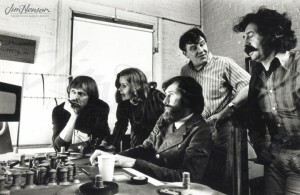 Jim with John Lovelady, Bonnie Erickson, Faz Fazakas and Don Sahlin in his East 67th Street office. Jim on East 67th Street, 1970s. This entry was posted in 05-May '73, 1973, Sesame Street and tagged ABC, Al Gottesman, Bonnie Erickson, Caroll Spinney, Caroly Wilcox, Danny Seagren, Dave Goelz, Diana Birkenfield, Don Sahlin, Faz Fazakas, Fran Brill, Frank Oz, Jerry Juhl, Jerry Nelson, John Lovelady, Michael Eisner, Muppets, Richard Hunt, Sesame Street. Bookmark the permalink.